At the kickoff sesion of this morning’s IBM Industry Summit, IBM senior vice president of sales, marketing and strategy, Ginny Rometty, articulated a vision for organizations around the globe on how they could practically execute against the smarter planet agenda. IBM Senior Vice President Ginny Rometty guides the IBM Industry Summit audience as to how companies can navigate their way to smarter business in the "new normal." But first, she helped to rearticulate the problem statement through an example many may have already forgotten, the rice shortage crisis from early 2008. Rometty explained she was traveling in Asia, and befuddled that in this day and age there would be a run on rice. Once back at her office, she polled several colleagues from IBM Asia, and asked them what they thought was the cause of the shortage: Market speculation, climate change, growing demographics, what? In truth, it was all these things, but the “system of systems” had been overrun by its own complexity. And ironically, a report released over a year later from the U.S. Dept. of Agriculture stated that 2007-08 had been a record crop for rice! There were huge inefficiencies in the vast distribution and supply chain system for rice, and not unlike the global financial crisis, it was those inefficiencies and interconnectedness that led to the rice riots to occur in the midst of the greatest rice crop in years. With that as the backdrop, and the problem statement established, Rometty then began to explain what organizations around the globe must do if they wish to embrace the complexity of such “systems of systems,” and start to capitalize on the new opportunities they present. Because this one example was emblematic of broader, but common challenges facing the world: All the systems that govern our businesses are really interconnected. Also, companies everywhere have started to realize the increasing costs of their longstanding inefficiencies. Which leads to the third understanding: We have to change. This is clearly not sustainable. To respond (and keep their jobs), CEOs must start to focus their energy on productivity and structural change, continued Rometty. Therein lies the promise and the aspiration of a smarter planet. It really is a new way of thinking about your business and its opportunity in the world. So how as a business do I get started on this concept of a smarter industry, Rometty asked? 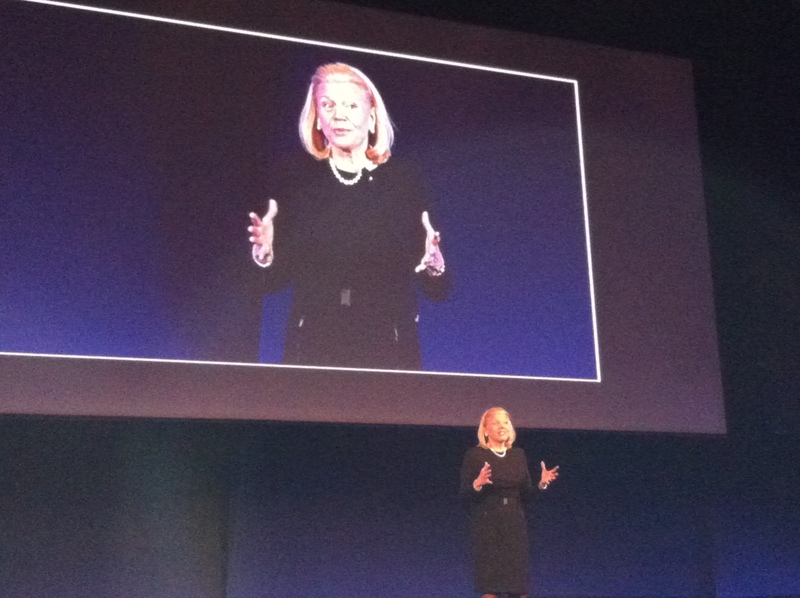 Rometty answered the question by outlining the fact that IBM has done over 600 engagements around the globe, and half were done with partners like those in the room here in Barcelona. The first step is simple: Understand the performance of your business by instrumentation. You can’t know how fast you’re driving if your car doesn’t have a speedometer. That’s why IBM has related this idea of embedded technology (RFID, sensor data, etc.) To bridge the digital and analog world, we have to instrument, measure, and then manage it. As an example, Rometty mentioned a Vietnamese seafood company which uses RFID sensors to monitor, from trawler to market, its fish catches to ensure quality control, manage inventory, and prove the premium value of its catch. Second, companies must integrate to innovate. Organizations must be willing to evolve and adapt horizontally, across all their systems and structures, so that they can then be prepared to apply business analytics more effectively. Rometty mentioned Toyota, which built an industrial waste efficiency project that the company spun off as a separate business unit, Ecomanage Network Corporation, to help other manufacturers facing the same waste management challenges. Rometty also mentioned how supercomputing capability has evolved during the past decade. We’ve gone from Deep Blue, a supercomputer playing a chess game (but one with ultimately finite moves) to “Watson” (named after IBM’s founder, Thomas Watson), the new supercomputer learning how to play against humans with infinite possibliities in the “Jeaopardy” TV game show. Much laughter in the audience before Rometty moved on to the third step: Optimize to transform. Now that you’ve built a foundation using instrumentation and new analytics, you can now move on to the art of the possible: Optimizing your system towards a specific business goal. Predictive analytics is very different from the “looking backwards” model businesses have historically depended on. The next decade, argued Rometty, will be one of predicting the future before it happens. Unless you think she was now on to soothsaying, Rometty mentioned the Singapore Land Transit Authority, where technology is helping Singapore predict bus arrival times at a 98% accuracy rate, and helping commuters understand bus seat inventory via their mobile devices. So what’s required to pull off this transformation, Rometty asked? Three things. Leadership featuring an analytics based-culture. Systems thinking. And new forms of collaboration. With regards to analytics, it’s actually simple to say (harder to do): Get your company and its people to move from guessing about your business via HIPPO (Highest Paid Person in the Room) and gut judgment, to one based on facts and trusted data that yields action. Two, don’t get caught in the rice shortage paddy! Develop a culture of systems thinking so your organization is more adept and able to respond to unexpected crises, no matter their orientation. And three, build a culture of collaboration. Your partners, your suppliers, your customers, all are key constituents in a supply chain of new ideas and possibilities for your business, but only if you facilitate and tap into their expertise and insights. Pioneering companies which rethink their business systems and models, reinvent their outdated processes, and leverage analytics effectively moving will be poised to move beyond the “new normal” and instead realize new growth and outcomes for their companies. Great coverage, Todd. I think this is the clearest explanation of Smarter Planet that I’ve read. Will we be able to see or hear a recording of Ginny’s remarks in the near future? Well, first off, those kudos mean quite a lot, especially coming from you. So, muchas gracias for that! But all due credit certainly goes to Ginny Rometty and her team. As for any filming for posterity’s sake, I don’t know that there was any, so my summary may have to suffice for now. But know that she, along with several of our other executives, did a brilliant job telling the IBM smarter planet agenda story here in Barcelona for our business partners and C-level executives, and I’m certainly looking forward to the last and final day manana. In the meantime, also know I look forward to catching up soon to learn more about the arc of your information science studies! Well done Todd. Great coverage of all the speeches. In this one, it is particularly great that you captured Ginni’s sense of humor. along with her clarity of message. Thanks much. Thanks for the feedback, Andrea. I really enjoyed all the talks, so hope I did them justice in the blogging. And you’re right, Ginni was quite funny and engaging, and the message spot on.